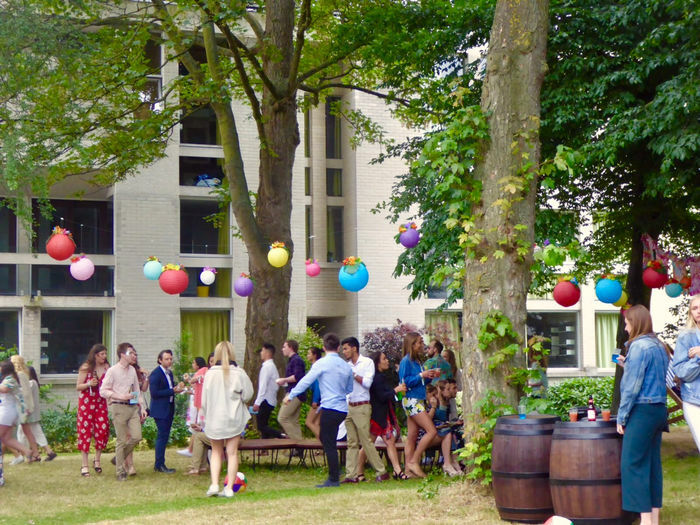 Whether Catz or Clare, Christ’s or Cai..., sorry, Corpus, all May Balls are basically the same: herds of party-seeking students set loose on an all-night spree of unlimited food, drink and entertainment. But the 152nd First and Third Trinity Boat Club May Ball was also so much more. It had everything you’d expect from a May Ball, but elevated to a whole new level. In some places this new level was literally just that: the rooftop terrace built by the river and the dizzying rock-o-plane wheel both gave guests bird’s-eye views over the rest of the ball. But in general it was the ball’s obsession with consummate quality which set it apart from other May Week festivities. This obsession was clear within each of the ball’s individual parts. Bubbly wasn’t wholesale sparkling wine but bona fide champagne. The photobooth wasn’t a box with silly props but a rig with 15 separate DSLR cameras creating a Matrix-style ‘bullet time’ shot. The headliner set from Raye wasn’t just an hour of hype and crowd-pleasers but an immersive experience crowned with smoke machines and confetti. Most other parts of the ball could be described in similar terms: hallmarks of remarkable ingenuity and immaculate attention to detail. The ball as an overall visual spectacle was also unique. LED-lit trees dotted the paddocks, and an elegant water display was installed on the Cam as ambience (and wasn’t obscured by metal fencing like the water display at John’s). The fireworks were outstanding; with soundtrack tributes to Avicii and Stephen Hawking, plus a light projection show following the pyrotechnics. Trinity’s ability to deliver true variety was particularly impressive. With food there was strong variety in every sense, whether in terms of regional mix (Argentinean empanadas accompanied Egyptian koshari), portion size (hearty dosa wraps could be followed by Aromi’s petits fours), or, pleasingly, dietary requirements (exclusively vegan food stands were as prominent as the oyster and smoked meat sandwich stands). The abundance of bars, too, meant they served everything from espresso martinis to craft mead to jaegerbombs. It also meant drinks were only ever a short walk away and queues mostly non-existent. To guests’ satisfaction, bevs were consistently strong throughout the night: a ‘double’ vodka coke really did taste like it had 50ml of spirit in it. Most satisfying was how there was always more of the ball to be discovered as the night went on, even after traversing the whole thing several times. The partially concealed Willow Bar in the corner of the paddocks, the Steelworks disco cellar hidden underneath the Great Hall, and the unannounced availability of punt tours to say hello to friends at neighbouring Clare May Ball were all unexpected delights when I stumbled across them towards the night’s end. Nonetheless, there were a few grumbling points. A power outage briefly plunged half of the ball into darkness and silence (leaving a dozen unlucky guests suspended upside down on the rock-o-plane ride). Some of the food left guests wanting, especially after the long queues: the lobster grilled cheese didn’t have much lobster at all, and few guests would have noticed if the chilli chips available after midnight were replaced by the Van of Life’s freshest offerings. But these are ultimately minor gripes; the ball’s committee can justifiably stomach them in the grander scheme of such a complex operation. Once again, Trinity emphatically reaffirmed its status as May Week’s centrepiece occasion.